Cuelinks WordPress Plugin – Cuelinks is one of the best content monetization tool available on the internet.In my previous post, I wrote regarding Cuelinks Chrome extension which is easy to use to know merchant payouts rate.The Cuelinks monetization program converts relevant keywords & links in your content into affiliate links automatically. How To Install Cuelinks Plugin ? As I have mentioned above you can use two methods 1.Via FTP 2.From WordPress dashboard. Now activate from WordPress account dashboard. How To Setup Plugin ? You can see Cuelinks setting option in left side panel.Click on setting to make it active.You need to submit Cuelinks publisher ID in the blank box.I have submitted my ID and you can see its current status is active.The plugin works fine as soon as you submit publisher ID. 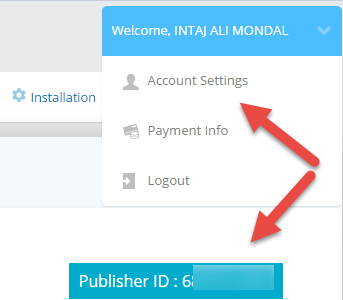 Follow the below steps to look up your unique Cuelinks publisher Id. You can now check your links and keywords are converted to affiliate links.Therefore when your visitors click on a link and make a successful transaction,you will receive the affiliate commission from them.However, not all the links generate commission as they should be associated with Cuelinks.You can check supported merchant list from their dashboard or use Google chrome extension. Hope this article helps you to set up Cuelinks Plugin.Share your feedback and experience with Cuelinks at the below comment section.